Two shots of espresso are provided on the side of a cup or glass with vanella ice cream. Affogato coffee at the Acme Cafe. 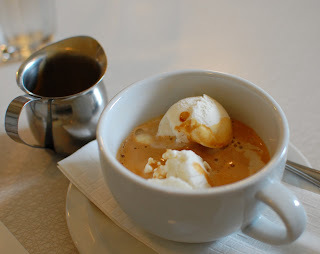 Far too few coffeehouses offer affogato coffee, which is shameful, as it provides the perfect combination of bitter and sweet to finish off a great meal. Yum! Stumptown facing Boston Common has affogato on the menu -- when the weather gets nicer I'll be sure to let you know if it's worth a trip to the opposite coast for! West-coast coffee in Boston? What a treat! Be certain to report back.